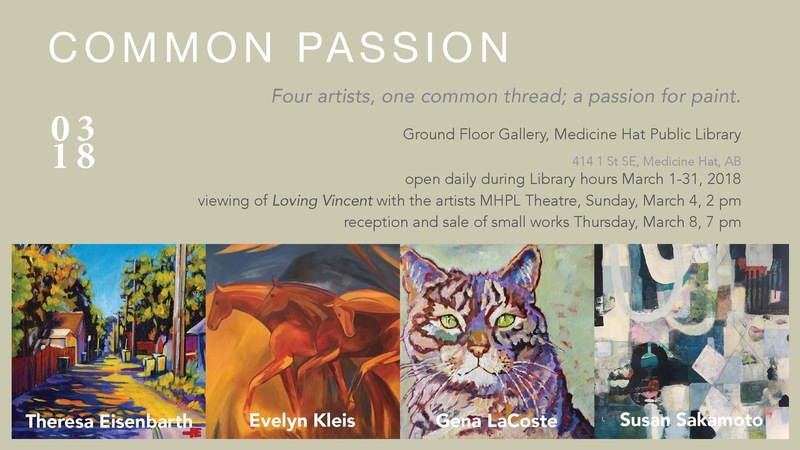 Common passion is a is a brand new art show by four Medicine Hat artists. They have something in common- a passion to paint! 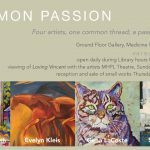 Featuring brand new artwork by Theresa Eisenbarth, Evelyn Kleis, Gena LaCoste and Susan Sakamoto. Each artist has their own unique style. Come join us to view a selection of paintings ranging from Theresa’s landscapes of Medicine Hat, to Susan’s layered encaustics, to Evelyn’s delightful assemblages, to Gena’s spectacular landscapes and equatrians. Hosted in conjunction with The MHPL, it’s sure to be an art show full of wonderful people, great conversation and of course…beautiful art. Opening reception and sale of small works with the artists, Thursday, March 8 at 7:00 pm. For those interested, there will be a public viewing of the movie Loving Vincent on Sunday, March 2 at 2 pm. For more information about the show or to reserve your spot, please contact the Medicine Hat Public Library.